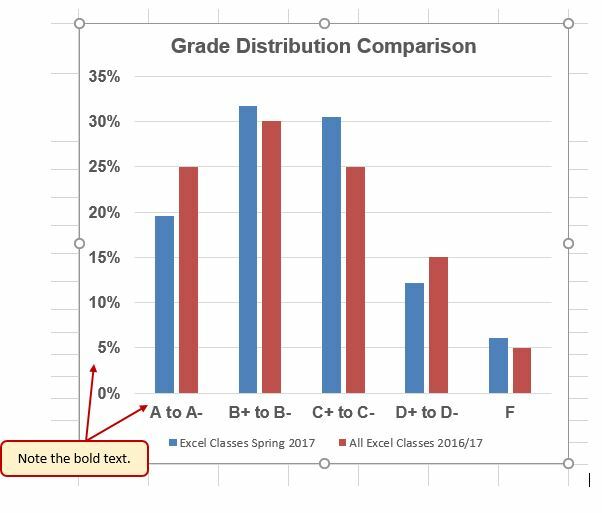 Switch to the Grade Distribution worksheet and click anywhere along the X axis (horizontal axis) of the Grade Distribution Comparison chart. Right click and select Font. 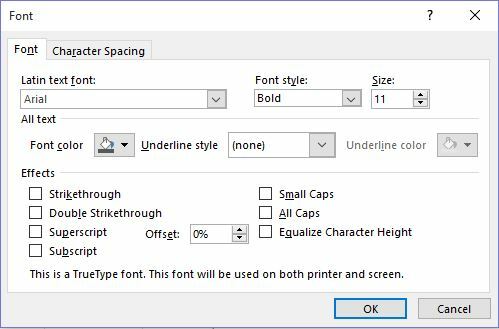 Change the font to Arial, the Font Style to Bold, and the Size to 11 (see Figure 4.26). Click anywhere along the Y axis to activate it and repeat steps 2 and 3. Click on the chart title and repeat steps 2 and 3, but set the Size to 14. The final appearance of the axes is shown in Figure 4.27 Formatted X & Y Axes. Next we want to make some changes to the percentage numbers on the Y (vertical) axis. Right click the vertical (value) axis. Select Format Axis. This opens the Format Axis pane. Click Number from the list of options. The commands in this section of the Format Axis pane are used to format numbers that appear on the selected axis of the chart. Click in the Decimal places input box and change the value to 1. Select Axis Options. Change the Minimum Bound to .05 to make the differences in the columns more dramatic. 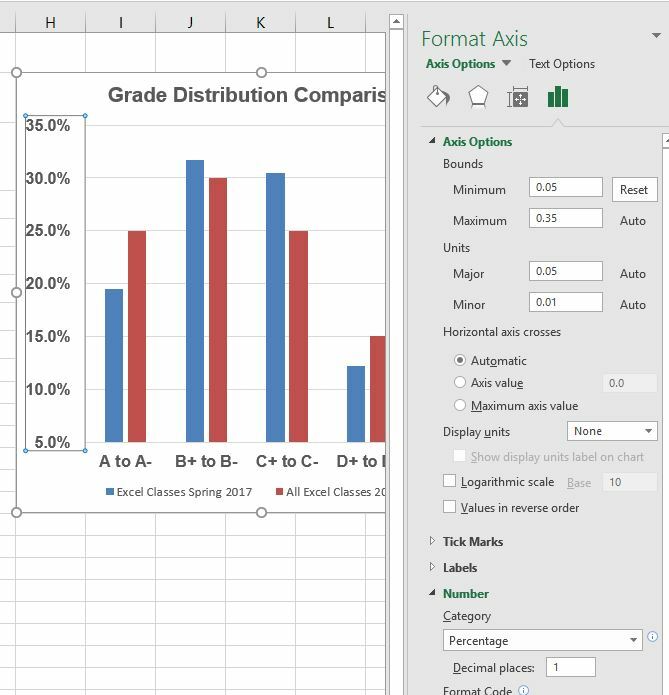 The Format Axis pane should match Figure 4.28. Click the Close button at the top of the Format Axis pane. Note: Experiment! You can also change font styling using shortcut keys and the buttons on the Home tab. Click the Close button in the Format Axis pane. 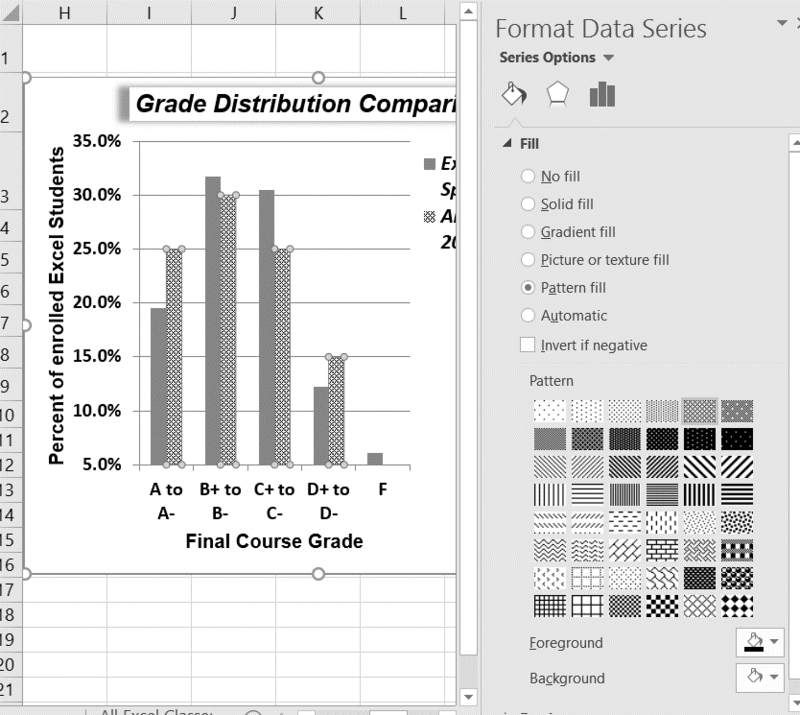 Right click the legend on the Grade Distribution Comparison chart and select Format Legend. Select Right in the Legend Position options. Close the Format Legend pane. Move the legend by placing your cursor – shaped like a little plus sign with four arrows – on the edge of the selection box. Click and drag the legend so the top of the legend aligns with the 35% line next to the plot area (see Figure 4.29). While the legend is still selected, change the font style in the Home tab of the ribbon to Arial. Click and drag the left sizing handle so the legend is against the plot area (see Figure 4.30). Right click on the chart title and select Format Chart Title to open the Format Chart Title pane. Under Title Options , in the Effects group (the option in the middle) give your title one of the Preset shadows. Change the color, if you like. Close the Format Chart Title pane. Click either the Home tab or right click to activate the appropriate formatting pane. Select any of the available formatting commands. Using the Home ribbon, change the font of the axis title to Arial, Bold, size 11. Click in the beginning of the Y axis title and delete the generic title. 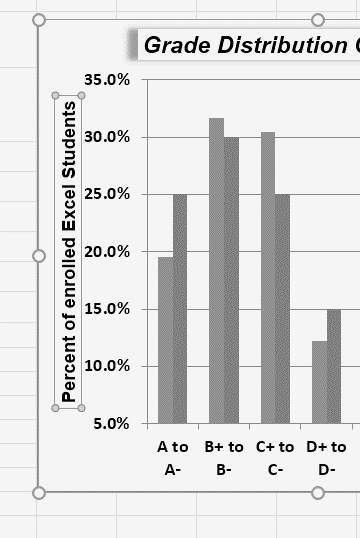 Type Percent of Enrolled Excel Students. (see Figure 4.33). Next we will add the title for the X axis. On the Design tab select the Add Chart Element button, then Axis Titles, then Primary Horizontal. Click in the beginning of the X axis title and delete the generic title. Type Final Course Grade. Figure 4.34 shows the added titles for the X and Y axes. 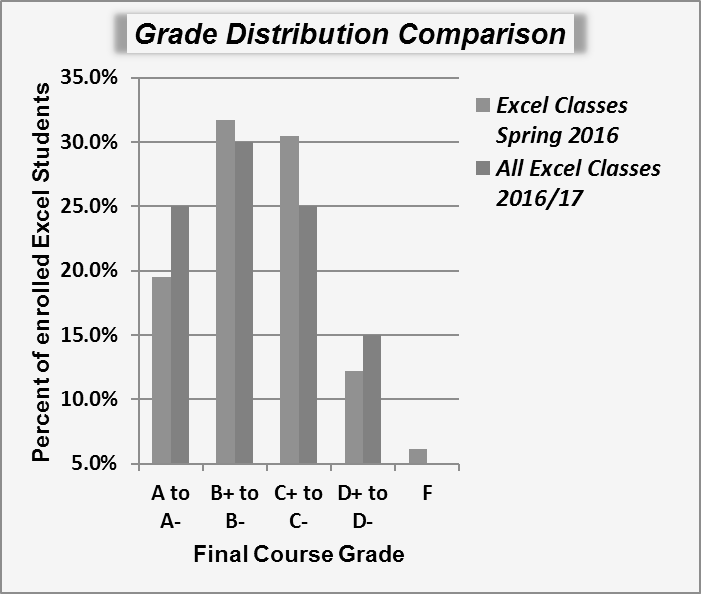 The titles provide definitions for the grade categories along the X axis as well as the percentages on the Y axis. On the Design tab select the Add Chart Element button. Select one of the options from the second drop-down list. 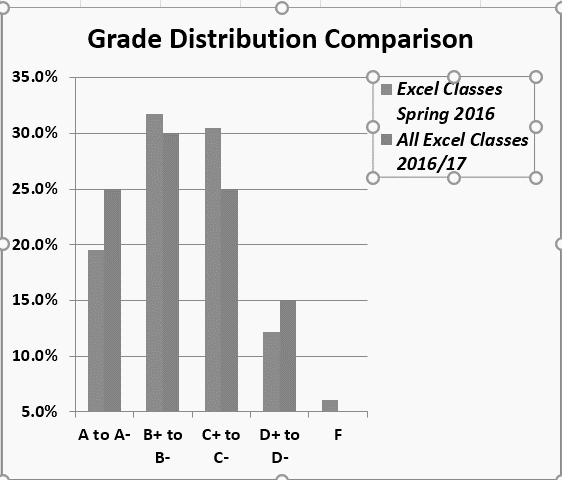 Click on any of the the red bars representing the All Excel Classes data series on the Grade Distribution Comparison chart in the Grade Distribution worksheet. Clicking one bar automatically activates all bars in the data series. If you click a bar a second time, only that bar is activated. Right click and select Format Data Series to open up the Format Data Series pane. Click the Fill and Line (paint bucket) button to bring up the Fill and Border group of commands. Click the word Fill (if needed) to expand the list of Fill options. Select Pattern Fill. Then select 30% (fifth column, top row). Changing your fill pattern to a pattern makes it easier to distinguish between the data series when you print or view your chart in black and white. While you are there, make changes to the fill by experimenting with different foreground and background colors. Now we are going to add the Data Labels at the end of the columns. Be sure that your entire chart is selected, not just one of the data series. Click the Design tab in the Chart Tools section of the ribbon. Click on one of the Data Labels. Note that all of the data labels for that data series are selected. Using the Home ribbon, change the font to Arial, Bold, size 9. Click on one of the data labels for the other data series. Format those data labels as Arial, Bold, size 9 as well. Figure 4.37 shows the Grade Distribution Comparison chart with the completed formatting adjustments and labels added to the data series. Note that we can move each individual data label. This might be necessary if two data labels overlap or if a data label falls in the middle of a grid line. To move an individual data label, click it twice, then click and drag. Click the Design tab in the Chart Tools section of the ribbon. Click the Add Chart Element in the Chart Layout group. Select one of the preset positions from the drop-down list. Right click to activate the Format Data Series pane. 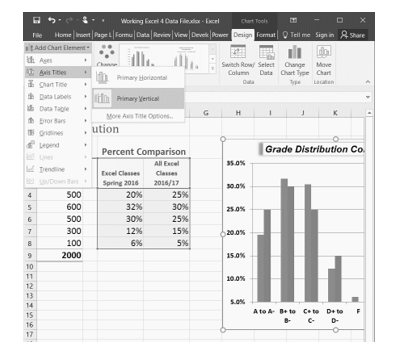 Use the formatting tools in the pane to make changes to the data series. 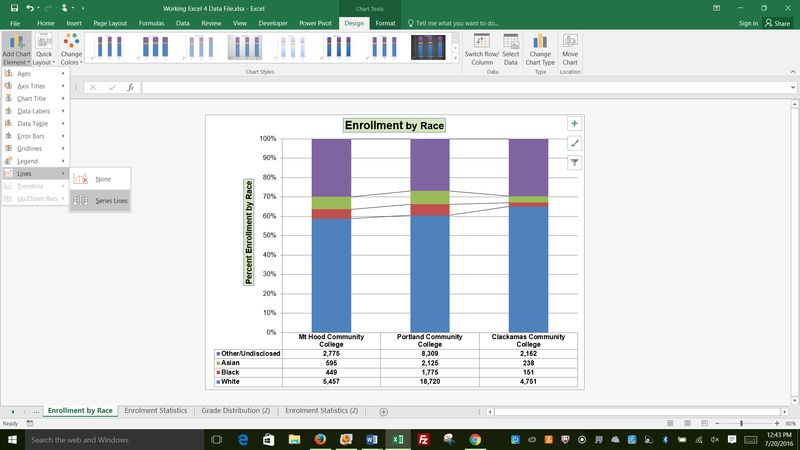 Locate the Enrollment by Race stacked column chart on the Enrollment Statistics worksheet. Activate the chart by clicking anywhere inside the chart perimeter. 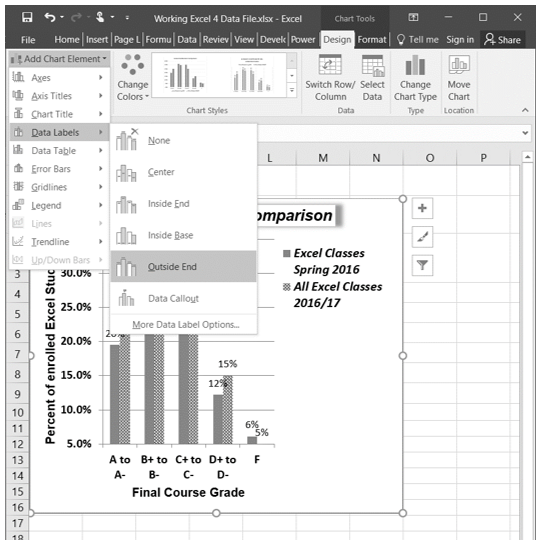 Move the chart to a separate chart sheet by clicking the Move Chart button in the Design tab of the ribbon. Type the following in the New sheet input box: Enrollment by Race Chart. Click the OK button. Click anywhere on the data table (on the x axis) to activate it. Using the Home ribbon, change the font to Arial, Bold, size 12. 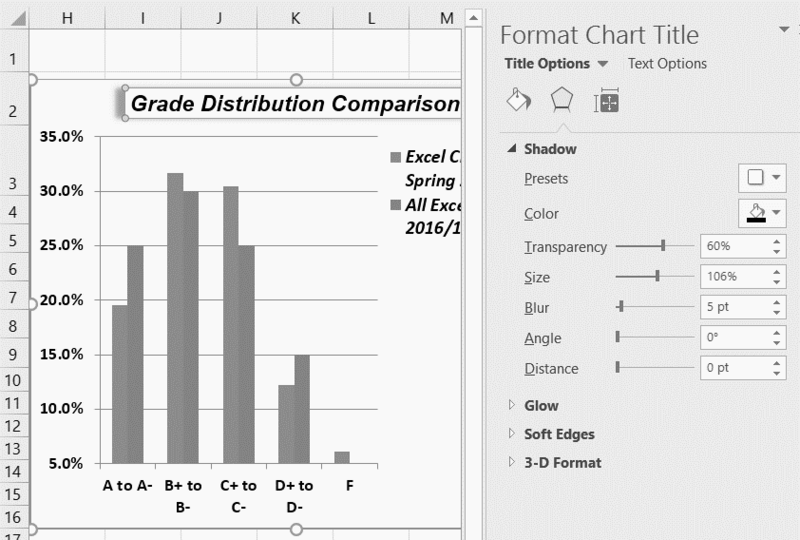 Add a Y axis title using Add Chart Elements – Axis Titles – then More Axis Title Options. In the Format Axis Title pane change the fill color and border to colors of your choice. Then, using the Home tab of the ribbon, change the font to Arial, Bold, size 14. 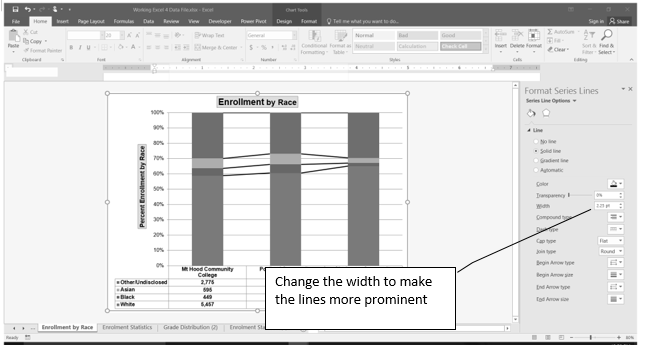 Change the text of the Y axis title to Percent Enrollment by Race. Check the horizontal axis to see if this process created an extra axis title there. If it did, delete it. Activate the title of the chart by clicking it once. The Format Chart Title pane should be open. If not, right click the Chart title and select Format Chart Title from the menu. Change the fill and border to match your vertical Axis label. Then, using the Home tab of the ribbon, change the font of the chart title to Arial, Bold, size 20. Click the Add Chart Elements tool (Design tab), then Lines, then Series Lines. This adds lines to the chart, connecting each data series between the three stacks (see Figure 4.38). Select Format Series Lines. This will open the Format Series Lines pane. Change the width to 2.25. Close the Format Series Lines pane. Figure 4.39 shows the appearance of the chart with the series lines connecting the two stacks. This formatting enhancement is common for stacked column charts. The lines help focus the audience’s attention to changes in the percent of total trend. 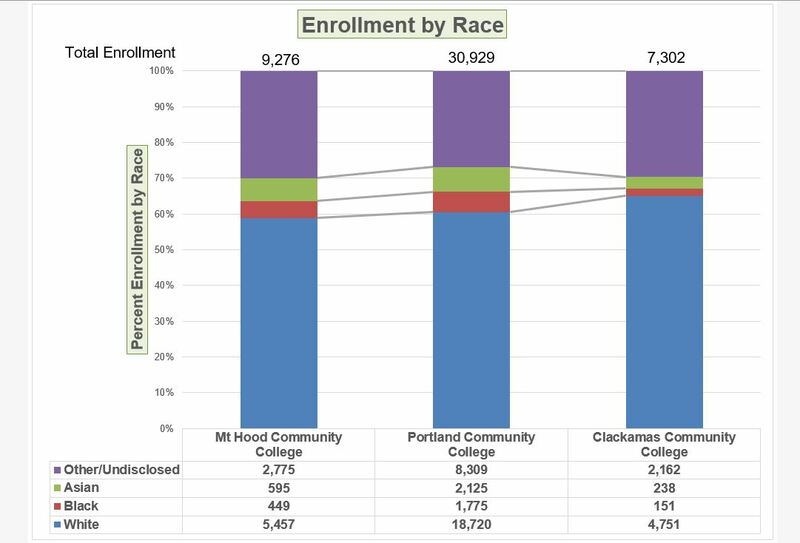 Our chart demonstrates the percentage differences in enrollment between the community colleges. But, it would be handy to know the total Enrollment at each of the colleges. To display that, we will add text boxes above each column. To start with, we need to make room for the text boxes. Select the Plot Area. Place your cursor on the top center handle of the Plot Area and drag down about ½ inch. Add text boxes to include additional information in the chart. Click the Text Box button in the Text group on the Insert tab of the ribbon (see Figure 4.41). Place the mouse pointer on the left edge of the chart area approximately one-quarter inch from the top. Click and drag a rectangle approximately one and a half inches wide and one-quarter inch high (see Figure 4.41). Don’t worry if it’s not exact – you can move and resize text boxes at any time. Type Total Enrollment. This tells the audience the size of each school. Select all of the text in the text box. (You can either highlight the text or click on the border of the text box once to select all of the text). Using the Home tab of the ribbon, change the font to Arial, size 14. Repeat the process to add and format text boxes above each column. You can try to copy and paste the text boxes if you would like to save time. 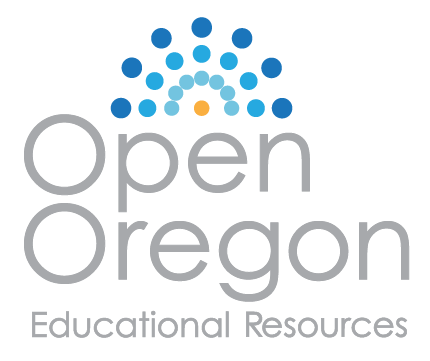 Adapted by Noreen Brown from How to Use Microsoft Excel: The Careers in Practice Series, adapted by The Saylor Foundation without attribution as requested by the work’s original creator or licensee, and licensed under CC BY-NC-SA 3.0.